We interrupt this blog with breaking news, the very import of which is sure to rattle the foundations of contemporary society as we have come to know it. Are you ready? Are you sitting down? 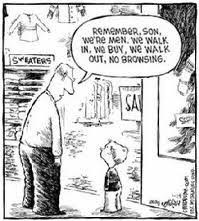 Men are better shoppers than women! You heard it here first. Men, give yourselves a pat on the back. If you are in the company of other men...chest-bump. Who knew. Personally I detest shopping. But then when I stop to think of it I detest it because I usually go shopping with my wife. And shopping with the wife can be a long and arduous process because we're not shopping for US. We're shopping for HER. My idea of shopping is going on-line to Amazon.com. Hell, I don't even have to leave home, let alone the couch. But a study released last week revealed that even though women shop more frequently, they're more likely to come home empty-handed after a shopping trip. (Whew!) Big surprise there. They've already got everything they already need. My wife's closet(s) can attest to that! Meanwhile, (and no euphemisms here) men apparently have " an in and out, no messing about approach" and purchase items within 26 minutes of spotting them. I don't know who exactly timed these guys but I read this on the internet so it has to be true. I can see how this makes sense. Think about it. Women already have all the clothes, shoes, handbags and potato peelers they need. When they shop they're looking at things they already have. Men, however - according to the study conducted by the firm Austin Reed - are more focused, efficient and know what they want. And they tend to shop for items that will last them for several years. Works for me. I remember buying my big screen TV in less than 15 minutes; a set of golf clubs within 10 minutes and a laptop five minutes after I'd walked into Best Buy. And tube sox and underwear at WalMart bought and bagged within 3 minutes flat. Yep. Focused. Efficient. Items that will last. Complete with an overdraft on my credit card. Honey, can you lend me $30. I need more tube socks. I must have accidentally gotten this "manly" gene, because I, too, detest shopping. I only like to get in, get out, get her done. Yeah, no wonder I have so few friends that are girls! It isn't focus and efficiency for the guys - it's the short attention span. Quirks: You sound like an anomaly. But my kinda woman! laughingmom: I take umbridge to that re... look a sale on tube socks! Leeuna: Your shopping habits are giving women a GOOD name. What's up? Have I fallen into a parallel universe? I'm also with Quirky and Leeuna, particularly with grocery shopping. I don't do much of any other shopping but I think I spend most of my time at (or will "browse") the hardware store. I don't know why. I'm with you on the shopping "detest" attitude. My mantra (if I have one) is simple. It's the same when I play the slots at Hard Rock. Take a limited amount of cash and write down what you are going to buy. Set a "target" time to get the hell out of the store. Abide by this and your shopping will be done quickly, efficiently and without unnecessary medical problems such as heart attacks when you open up your monthly bank statement. Oh, I'm twice divorced too. May want to factor that in somewhere. Huh, how come I ended up with the one man in the universe who can't make a decision to buy something if his life depended on it. Shopping with M is very frustrating. 00dozo: I do our grocery shopping. And for me it's in and out. You know, for things like beer, chips, cookies, pop - the essentials. Sometimes I'll even get vegetables if the wife puts them on the list. Donnie: I think we can all learn from your vast experience. I can see how "twice-divorced" might affect your bank balance. No wonder you're so focused when you shop. You've hardly any money left over for yourself! Ziva: But you see that's the thing. You're doing it wrong. Don't shop together. Try sending him out on his own! Do you have joint or separate bank accounts? It might make a difference. Theresa and I had this very "discussion" last week. I, a man, do NOT shop. I need something, I buy it. No "browsing." Theresa, on the other hand, will go to a store (usually Target, but Bed, Bath, and Beyond My Budget is up there as well) with absolutely nothing in mind and just wander. That's it. I was definitely a man in my last life - and I still have the same traits today to prove it. When I shop - which isn't very often - because I abhor shopping - I always bring a list of exactly what I need. I go into the store - get what's on my list - and get out as quickly as possible. No dilly-dallying, and no perusing the aisles. Chris: Bed, Bath and Beyond My Budget. Ha, ha. Love it. Wish I'd thought of it. All I can think of is that line "My wife's a plastic surgeon. You should see her operate with my credit cards." meleah rebeccah: You are certainly one of the most sensible women I've ever had the pleasure to meet. You are ....duh, winning! My god, I shop like a man. Hmm. I go both ways, so to speak. I bought my wife's anniversary present yesterday in less than five minutes. I knew exactly what I wanted, went in, got it, and that's that. Manly! But sometimes I do love to just browse around, feel the stuff, look at the variety, no intention to buy, try stuff on, take my time deciding what I like and what I don't. I know that's kind of girly. See? I go both ways. I like girls, though. So maybe I'm a lesbian trapped in a man's body! Chelle: no tube socks for you then? Nicky: Yay, my faith in women has been restored! Ferd, meet Offended Blogger. Chelle, meet Ferd. These comments are starting to go in a whole different direction that I hadn't anticipated. I like to get in, get out, nobody gets hurt. My husband will try on 7 or 8 pairs of levi's. They are jeans, for heavens sake! He also will try on white dress shirt after white dress shirt to find "the one". I hate shopping with him. I walk in, ask for the Prada pump, try it on one foot. And go pay my $800. Easy breezy! The only time I take my husband shopping is when I go to Sam's Club or Costco, the big warehouse stores. It's entertainment for me to watch him pile up cases of tuna and canned corn and a 5 pound bag of croutons. He has no idea what we need but throws it on the industrial size shopping cart anyway. Linda: Sorry, I didn't realize you only had one foot. But think of it this way: if you had 2 those shoes would have cost $1600. Sue: Shopping there would be dangerous. They only have one size - BIG! I'm a failure as a woman... I HATE shopping! Bless you, Amazon! Herman: I hate when you've made your purchase but the stuff still causes the security mechanism to beep wildly as you make your way out the door. Of course, everyone on the store looks up to see who's trying to shop lift. Sheesh. No wonder I hate to shop. Boom Boom:Funny how, through these comments, I've learned that so many women hate to shop. I never would have thought. I can be in and out of the shoe store in 5 minutes or so. I always buy the same shoes, I know where they are, and I don't bother trying them on. My big hold up with the process is waiting for the receipt to print out. Cdn Blend: Chest-bump, my man. Funny you should mention this as I went to Walmart yesterday to buy (not shop for) pants. I knew exactly what I wanted, went in, grabbed them (and besides a shirt I also picked up) and was gone. Plus I don't know anyone who really wants to hang out in Walmart. U.P. : I hope you paid for them! On the upside, sounds like you were probably too fast to be photographed by the folks at People of Wal Mart. Yep, I checked their website and you're not there. Oh, yes, and I paid for them. Good point. Whew! I really didn't want to be on that site. U.P. : OK, good. You did say you "grabbed" them. But I didn't think you took advantage of a five-fingered discount. Have you ever noticed that all the "man" stuff is in the back of the store? I hate you Sam Walton. Jamie: Sure. They make you walk past all the other stuff. Have you heard of impulse buying? I'm proud to say I shop like a man! brookeamanda: I hope it ends there. Gee, you disappoint me. I'm the worst possible shopper. Price, quality and looks all grab me by the balls and render me incapable of making a quick decision. I've spent 30 minutes debating whether to buy this blender or that, and I probably return at least 60 percent of what I do buy. The net has helped, though, because I can do research ahead of time, at my own pace. Mike: You're a shopping nightmare. You do all that research and yet take 60 percent of what you buy back?